In recent years, critics of U.S. oil and gas development have pushed for regulations establishing more separation between drilling sites and local structures, such as buildings or residential areas. Environmental groups often claim these rules are simply designed for a better overall regulatory structure, but a closer examination suggests that the real goal is to ban drilling altogether. The allowable distances between well sites and established structures — also called setbacks — vary by region. But as U.S. oil and gas production has increased significantly over the past few years, many activist groups have adopted new tactics to try to limit development in any manner possible. That includes making it nearly impossible to operate through overly restrictive local ordinances, such as abnormally large setbacks. The situation is the most pronounced in the Barnett Shale of north Texas, where environmentalists have claimed certain setbacks are necessary to protect public health, even as industry operations have occurred safely in other parts of the region with setbacks that are far less than the distances that many activists claim are required. In the city of Fort Worth, which houses more than 1,000 wells, the setback is 600 feet. A major air quality study conducted for the city in 2011 – around the time when Barnett Shale gas production was at its highest point – concluded that “Fort Worth’s 600-foot setback distance is adequate” to protect public health. The available data also “did not reveal any significant health threats,” according to the study. Despite those findings, critics have lobbied other cities throughout the Metroplex to adopt stricter ordinances that increase setbacks to more than twice the distance allowed in Fort Worth. Last year, when Dallas adopted its new drilling ordinance, the language contained a 1,500 foot setback, meaning each new well site would require a buffer zone that’s nearly one million square feet larger than the acreage of AT&T Stadium and its associated parking lot. Earthworks celebrated the setback as a “de facto drilling ban,” and the Texas Observer called it a “victory for fracking opponents.” The Natural Resources Defense Council – an organization that supports a moratorium on fracking – also cheered passage of the ordinance. For about a year, the city managed to stall the task force, until a weak ordinance was finally submitted to the planning and zoning commission. By the time the proposed ordinance hit the City Council in 2011, Occupy Denton, then at its peak, helped galvanize grassroots activists, who organized and won a moratorium on fracking permits in the city, while a revised ordinance was put together. The meetings where public comments were allowed were always attended by at least 20 anti-fracking activists, and DAG and Denton Off Fossil Fuels (DOFF) maintained a presence, while trying to figure out how to propose our own ordinance. In fact, DOFF debated whether to propose a full ban or a “de facto” ban–by proposing setbacks of 1,200 feet. To the south, activists in College Station have gone even further, calling for a “minimal setback of at least 1/2 mile.” The same group — Protect Brazos County, Texas — lists “a petition to ban fracking within City limits” as part of its “What you can do” page. 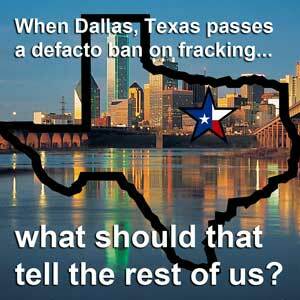 Drilling critics are now flooding into the city of Mansfield – located a few miles south of Arlington, Tex. – and using these “de facto bans” as momentum to try to change the local ordinance. Mansfield’s current setback is 600 feet, the same as Fort Worth’s. As described in a recent story in Fort Worth Weekly, a local organization recently “worked with Jim Schermbeck, director of Downwinders at Risk, to bring Dr. Ann Epstein to talk to Mansfield residents” about drilling. Epstein is a member of the City of Lubbock Board of Health, which has recommended a setback of 1,500 feet – exactly the same distance that established a “de facto ban” in Dallas. Epstein has said, however, that the Board “is not trying to ban fracking.” The Sierra Club — a major environmental group headquartered in San Francisco, and which opposes natural gas drilling — promoted Epstein’s presentation on its website. In a presentation to the Lubbock Board of Health, Dr. Anne Epstein cites research linking fetal abnormalities to nearby oil and gas drilling as justification to increase setbacks. The data for that research came from the Colorado Department of Public Health and Environment, which disavowed the findings and found no such link. Recently, Epstein submitted a minority report from the Oil and Gas Citizen Advisory Committee to the Lubbock city council, which also called for increased setbacks. Lubbock’s mayor, Glen Robertson, said of the report’s findings: “I think their data is flawed,” observing that the authors “gathered data in areas outside of Lubbock” as a means of influencing the debate inside the city. Last month, Downwinders observed that the push for a ban in Denton meant “it’ll be a tough slog for any company that wants to drill a new gas well in town.” After the Denton fracking ban passed, Downwinders called it a “successful citizens revolt,” before turning its attention southward: “The next organized front in the battle over urban gas drilling in DFW is the Fort Worth suburb of Mansfield,” Jim Schermbeck wrote on November 26th. A December 5th blog post from Downwinders also celebrated what it deemed “momentum” in Mansfield for increasing the setback distance to 1,500 feet. If critics of development want to ban drilling, then why don’t they just say so? The answer, in a word, is politics. In Denton, the local anti-fracking campaign tried to distance itself from advocating for an all-out drilling ban, stating on its website that its ballot measure to ban fracking “does not prohibit gas drilling in Denton,” and that “a prohibition on hydraulic fracturing is not a ban on gas drilling.” The activists’ stated concerns, however, had more to do with drilling than the specific “fracking” process, and the Texas Supreme Court has stated at least twice that fracking is required for development in the Barnett Shale. Similarly, before the Dallas de facto ban was finalized, city officials told the New York Times that they had “no intention of banning drilling” with their ordinance. The only problem, of course, is that if an ordinance effectively condemns any new drilling, then the regulatory approach is a distinction without a difference. Many of the activists throughout north Texas recognize that, and they desperately hope other residents don’t.